The steadily climbing death toll and wall-to-wall condemnation of the embassy move by the Arab world raised new doubts about Trump's ambitions to broker what he once said would be the Mideast "deal of the century"
In a jarring contrast, Israeli forces shot and killed dozens of Palestinians and woundedhundres more during mass protests Monday along the Gaza border, while just a few miles away Israel and the U.S. held a festive inauguration ceremony for the new American Embassy in contested Jerusalem. 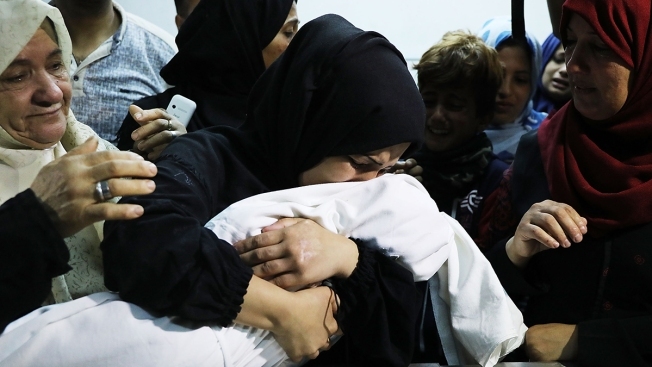 The Gaza Health Ministry said the Palestinian death toll in Gaza border protests had risen to 58, including 57 people killed by Israeli army fire and a baby who died from tear gas inhalation. The ministry said six of those killed by gunshots were minors. It said more than 2,700 people were injured Monday, including 1,360 by live fire. Of the wounded, 130 were in serious or critical condition. "What we saw today was unprecedented violence along the fence," said Brig. Gen. Ronen Manelis, the chief military spokesman, defending the tough Israeli response. "We are protecting Israel's citizens. We are defending our homes." "Thank you, President Trump for having the courage to keep your promises," Netanyahu said Monday. He said that "by recognizing history, you have made history." By nightfall, at least 55 Palestinians, including a young girl and four other minors, were killed, the Gaza Health Ministry said. It said 1,200 Palestinians were wounded by gunfire, including 116 who were in serious or critical condition. White House deputy press secretary Raj Shah said in a briefing Monday afternoon that "the responsibility for these tragic deaths rests squarely with Hamas" and Hamas "has been provoking this response." Egypt, an important Israeli ally, condemned the killings of Palestinian protesters, while the U.N. human rights chief, Zeid Ra'ad al-Hussein, decried the "shocking killing of dozens." Turkey accused Israel of "state terror." Turkey strongly condemned the U.S. Embassy move, calling it deemed "legally null and void" and said it was recalling its ambassador to the United States. It also recalled its ambassador to Israel following what it called a "massacre" of Palestinians on the Gaza border. South Africa, a fervent supporter of the Palestinians, also recalled its ambassador for consultations, the Israeli Foreign Ministry said. Associated Press writers Ilan Ben Zion, Mohammed Daraghmeh and Karin Laub contributed to this report.